I walked into the cozy Red Sandcastle Theatre on Tuesday night expecting to see another run-of-the-mill relationship drama. You know the type – they meet, they fall in love, they grow apart, there’s a conflict, they either resolve it or they don’t. What I actually saw was entirely different from what I was anticipating, however. 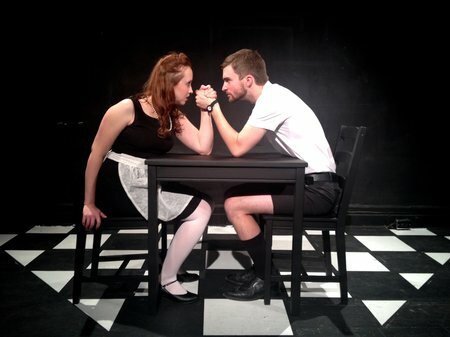 North of Maine‘s The Love Game is anything but typical, and the environment they’ve created in the storefront theatre is anything but cozy. What The Love Game is is bold, creative, surprising and oddly compelling. I say ‘oddly’ only because I can’t quite pinpoint exactly what it is that makes the show so intriguing. I sat through the first twenty minutes thinking it was an interesting idea, but not the show for me; I sat through the last forty completely fascinated. I got so wrapped up in the palpable tension onstage that I had to remind myself to breathe a few times. Britney Tangedal’s script is powerful and wonderfully different from anything I’ve seen, and the dialogue moves along at a Sorkin-like pace. Both Hilary Carroll and Jeff Dingle give incredibly strong performances as the anything-but-typical couple. I preferred his character to hers, but the actors themselves were equally funny, heartbreaking, intense, confusing and quirky. I daresay they gave the most solid opening night performances I’ve seen in a long time, and I can only imagine how much time must have gone into rehearsing such a dynamic, dialogue-heavy show. I will admit that elements of the set made me a bit crazy. Though I quite liked the idea of only using black and white pieces, the checkerboard-esque floor design had gaps and mismatched shapes, and made the slightly OCD part of my brain twitch just a little. While the actors did use much of the playing area, I would have liked to have seen the floor design extended so they wouldn’t have spent quite so much time off of the “game board”, as it were. My friend Jenn came with me to see the show, and agreed that she was pulled in as well, especially in the last half. She also appreciated the lightning-fast pacing and laugh-out-loud moments. We may have been the only audience members who didn’t know someone involved in the show personally (it felt a bit like being outsiders at a family reunion as everyone was arriving) but we were both just as entertained as the friends and family of the cast and crew seemed to be. You may have noticed that I haven’t said what the show is “about” – it’s a bit too meta to try to explain, and I don’t want to give anything away because it is such a unique and surprising production. Allow yourself to get through the first half, put aside any questions you feel like you really need the answers to, and just enjoy it. The payoff is worth it. It builds and twists until you think it can’t anymore, and then it twists just a little bit more. As Jenn pointed out, this type of production is the perfect reminder of how many hardworking theatre companies are out there putting on important, new, quality works. I can only hope that more of them dare to take the risks that The Love Game takes, and leave their audiences feeling as rewarded, satisfied, and – yes, oddly – compelled.